Three studies presented at the American Roentgen Ray Society’s (ARRS) annual meeting in May add further support to the practicality, versatility, and value of MRI studies in diagnosing and treating breast cancer. Two of the studies indicate that breast MRI could detect lesions that are often missed by mammography and ultrasound. The third suggests that whole-body MRI effectively addresses metastases. Combined, the results point toward more appropriate surgical treatment and, in turn, better patient outcomes. Many physicians believe breast MRI offers valuable information that is unobtainable with other imaging modalities. The perception has led to its increased application in preoperative evaluations of newly diagnosed patients. Researchers at the University of Rome La Sapienza in Italy analyzed breast MRI influence on surgical management options. The study involved 164 patients with biopsy-proven breast cancer. For 32 of these patients, breast MRI deployment led to modifying treatment plans that were previously suggested following mammography and ultrasound examinations. Breast MRI also detected 51 suspicious lesions that skirted mammographic and ultrasonic detection. This compelled lead researcher Valeria Dominelli, MD, to recommend breast MRI for mapping tumor extent in newly diagnosed breast cancer patients. More effective mapping not only leads to more effective treatment but also can reduce instances of reintervention, she notes. In another presentation at the ARRS meeting, Dominelli, a member of the radiological sciences department at the University of Rome La Sapienza, described how she and fellow researchers came up with findings suggesting that preoperative breast MRI usage could reduce local and regional breast cancer recurrence rates at follow-up. She says surgeons can choose the more appropriate surgical strategy (eg, conservative vs. mastectomy), or the patient can undergo neoadjuvant chemotherapy to reduce cancer size. “Moreover, early detection of contralateral disease can lead to simultaneous treatment of synchronous cancers, which can reduce local recurrence rates,” she points out. However, Dominelli concedes that any questions involving the impact of preoperative breast MRI on overall survival remains unanswered. Local and regional recurrences after breast-conserving surgery are rare, but breast density and age place patients at greater risk of recurrence. Regarding age, younger translates into more problematic, Dominelli says. A second study, also conducted at the University of Rome, included 49 patients with local recurrence discovered following surgical treatment of primary carcinoma. Ten of these patients (group A) underwent contrast-enhanced MRI before the initial surgery; the remaining 39 did not. By a substantial margin, local recurrence and contralateral carcinomas were found more often in the patients who did not undergo preoperative MRI. Dominelli says metachronous contralateral carcinoma and local recurrence in the ipsilateral breast were seen significantly more frequently in patients who had not undergone MRI compared with those who did. “We suggest that preoperative breast MRI staging had an important role in reducing the number of local cancer recurrences at follow-up in group A,” she says. Dominelli and colleagues say breast MRI should be recommended to patients with breast cancer for a better evaluation of disease extent, especially in young patients with dense breast tissue and those with invasive lobular carcinomas, which are better depicted with MRI than with mammography and ultrasound. “Preoperative breast MRI should be also recommended in patients with a cancer that shows a discrepancy in size of greater than 1 cm between mammography and sonography or patients under consideration for partial breast irradiation,” Dominelli says. She adds that preoperative MRI results should be interpreted by taking into account clinical breast examination, mammography, sonography, and verification by percutaneous biopsy. Furthermore, a multidisciplinary oncology team should decide changes in therapy planning resulting from preoperative MRI. A whole-body MRI study from India complements the aforementioned studies but suggests that whole-body MRI improves the accurate detection of breast cancer metastases. Such detection can help ensure patients get the most appropriate treatment, says the study’s lead author, Joshita Singh, MD, a consultant radiologist at Deenanath Mangeshkar Hospital and Research Center in Pune, India. Along with MRI, other modalities that can detect breast cancer metastases include PET/CT, chest x-rays, bone scans, and ultrasonic examination of appropriate areas (ie, pelvic and abdominal regions). PET/CT is particularly effective, and the study arose from the fact that radiologists at Deenanath Mangeshkar didn’t have a PET/CT scanner. In response, in 2005 they began investigating whole-body MRI for this application. This drove the need to determine effectiveness of the whole-body MRI protocol for metastasis workup in breast cancer patients. In the subsequent study, conducted at the Pune facility, Singh and fellow researcher Dhananjay Kelkar, MD, retrospectively analyzed MRI data in 99 patients evaluated for metastases. “We did a retrospective data analysis involving patients who underwent whole-body MRI from 2005 to 2009, using clinical follow-up to corroborate MRI findings,” Singh explains, adding that follow-up ranged from 0.5 to 57 months (with a 15.75-month median). Each patient underwent whole-body MRI at the initial workup and follow-up stages. Additionally, 30 patients underwent MRI for tumor, node, metastasis (TNM) staging. In all, the study included 114 exams in the 99 participating patients. MR images were acquired via 1.5T scanner enabled with total imaging matrix and parallel acquisition, with an average study time of 70 minutes. Patients also received a plain helical CT scan of the chest because CT has demonstrated higher sensitivity than MRI for detecting the smallest lung nodules. Singh points out that the study was noncomparative. “This wasn’t a prospective study that compared whole-body MRI to other simultaneous imaging modalities, nor did we have histopathological confirmation of MRI findings,” she says. Forty-seven of the 99 patients were positive for metastasis (bone, lung, liver, and brain were primary sites), while 52 were negative at the initial workup. “Of those patients who were positive for metastases, whole-body MRI frequently detected bone metastases earlier sometimes, even when the patient was still asymptomatic,” says Singh. In the study, 46 of the 52 nonmetastatic patients were disease free at the median follow-up point (21.8 months), Singh reports. Follow-up MRI revealed that five patients developed metastases. For these patients, she says the period between MRI and metastases development was rather long. Subsequently, 35 of the 47 patients who proved positive for metastasis died (at a postdiagnosis median time of four months); two surviving patients saw disease progression despite treatment; and 10 patients receiving treatment experienced disease control (median follow-up of 17.5 months). Also, in 13 of 30 patients (43%) where MRI was used for TNM staging, metastases were detected and disease was noted as stage 4. This information changed treatment. In addition, during the follow-up, whole-body MRI detected metastases in nine of 38 studies in asymptomatic patients, revealed additional metastatic sites in 11 symptomatic patients, and detected bone metastases earlier than symptoms in eight patients. Following data analysis performed many times during the five-year study period, the researchers perceived several advantages. “Besides being a nonionizing tool, whole-body MRI had high accuracy for brain, liver, and bone metastases,” Singh says, adding that when combined with plain helical CT acquisition of the chest, the protocol proves highly accurate in the detection of lung metastases. Singh describes the importance of accurate metastases detection: “At the initial TNM staging, it helps determine the prognosis and treatment plan. Metastases detection upstages the breast cancer to stage 4 and, if brain metastases are detected, whole-brain radiotherapy can be initiated. Also, after initial treatment is completed and the patient is on surveillance, clinicians can use MRI for metastases detection to guide further treatment that could be second-line chemotherapy, appropriate surgical intervention, or radiotherapy,” she says. Typically, in the follow-up setting, a physician performs the investigation according to a patient’s symptoms. But whole-body MRI provides an accurate, complete depiction of any disease spread. “For instance, a patient who comes back with vertebral metastases that cause neurological deficit, if we performed MRI of the spine, we would probably only treat the spine with as-necessary radiation. However, if in such a patient we do whole-body MRI and document liver metastases, we can also initiate second-line chemotherapy,” Singh explains. The researchers recommend that whole-body MRI be incorporated into the standard of care for metastases workup and TNM staging. Lack of radiation exposure enhances its value, Singh adds. — Dan Harvey is a freelance writer based in Wilmington, Del. 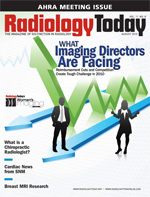 He is a frequent contributor to Radiology Today.